An animal rights group is calling for a boycott of the new Martin Scorsese film “The Wolf of Wall Street,” which stars Leonardo DiCaprio, over the treatment of a chimpanzee which appears in the movie. The group Friends of Animals (FOA) says the chimp named Chance may have suffered permanent psychological damage from the experience of acting in a film. Chance played the pet of the Wall Street mogul Jordan Belfort, based on the real-life stockbroker. Chance often rollerskates through the office wearing button-down shirts and slacks. Edita Birnkrant, the New York director of FOA, plans to “confront” Scorsese and DiCaprio at the red carpet premier of the movie in New York City on Tuesday. Birnkrant says Chance, who suffered cruel treatment from a circus trainer early in his life, could suffer from neurotic behaviors due to his appearance in the movie. If that is the case, she argues he will not be able to socially interact or be accepted by other chimps. 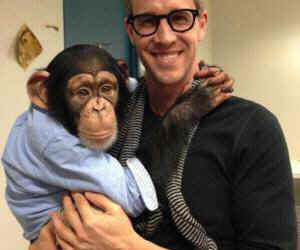 Danny Porush, who is depicted by Jonah Hill in the movie, told Mother Jones he never saw a chimp in their office. Porush said they also never participated in a game of “dwarf-tossing,” as depicted in the movie, but dwarves were frequent party guests. Porush was sentenced to 39 months in jail for securities fraud and money laundering in 2004. Belfort was indicted for securities fraud and money laundering in 1998. He served 22 months in federal prison and was ordered to pay back $110.4 million that he swindled from clients.